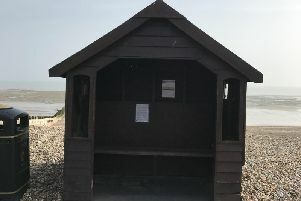 Shoreham residents have been encouraged to take urgent action to preserve rare species at Shoreham Beach local nature reserve. Ecologist Graeme Lyons was commissioned by Friends of Shoreham Beach to take a detailed survey of invertebrates living in the beach nature reserve. Presenting his results at a talk to the group, Graeme revealed more than ten per cent of the insects he found have conservation status. Graeme said: “No doubt many rare species have already been lost but there are still many species present that could be lost if a change in direction is not made soon. Graeme urged more than 50 listeners to take action, and gave guidance on the future management of the beach ecosystems. The survey was undertaken with funding granted by Tesco Bags of Help scheme and the Rampion Fund at Sussex Community Trust. Members of Friends of Shoreham Beach plan to help by removing selected areas of invasive species and preventing the spread of seedlings but the group will need help from volunteers. No experience is required but work will involve bending and doing some digging. Forks and gloves will be provided. The first working party will be on Tuesday (December 11) from 10am to 2pm at Shoreham Fort, Forthaven. Volunteers can turn up any time before 1.30pm, contact jawoolcock@ntlworld.com to be informed of any changes.